THE PORT OF SAVANNAH: It tops Drewry port connectivity index for North America with the best combination of mainline service calls and world regions directly served. Shanghai tops Drewry port connectivity index. Nine of the top ten ports in Drewry index are in Asia. For shippers, port connectivity is as important as port size or scale. Having the widest possible range of direct services is a significant competitive advantage for all ports. In the latest edition of our Ports & Terminals Insight report, Drewry has launched a regular, bespoke index of port connectivity in order to rank and monitor how well connected the world’s container ports are. Shanghai is the port with the highest (maximum) index figure, being directly connected by services to all world regions, and having the highest number of mainline services calling per week (168 in total). As the world’s largest container port, it is not surprising that Shanghai tops the table. Given the scale of the container port industry in Asia, and the extent of major gateway and hub ports, it is also not surprising that nine of the top ten ports are in Asia. The tenth place is occupied by the North European port of Rotterdam, but with a connectivity index score of only around one-third that of Shanghai. It is important to note here that the connectivity index deliberately does not take account of vessel size. The purpose of the index is to show the degree of connectivity (in essence, the ability of shippers using the port to directly access the widest range of origins and destinations). Hence, even though a large port with the same range of shipping services, but with larger ships, is likely to generate more port volume overall, its connectivity index may be no better than a smaller port with the same range of liner services. Taking a regional focus, and using North America as an example, the top four slots are all taken by East Coast ports, with Savannah in first place by virtue of having the best combination of mainline service calls per week and world regions directly served. At first glance, it is surprising that the largest port in the North American region (Los Angeles) is only sixth in the table, and the second largest (Long Beach) is not in the top 10 at all (it is 12th). However, this is because ports concentrated on one or two trade routes, e.g. west coast North America ports serving the transpacific will not score as highly as those with a wider range of regions served directly. Therefore, for example, Los Angeles and Long Beach do not score as highly in terms of connectivity as Savannah, despite being bigger ports. 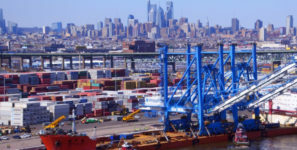 East coast North America ports, such as Savannah, have connections to Europe, Asia and elsewhere due to their geography, whereas WCNA ports, such as Los Angeles and Long Beach, tend to have a more singular focus with Asia. Long Beach has fewer services per week than Los Angeles (18 versus 25), but also serves one fewer world regions directly (four versus five), hence its lower position in the North American ranking. Similarly, in the UK, London Gateway scores higher than Felixstowe and Southampton, even though it only has around a quarter of the throughput of Felixstowe and less than half of Southampton. However, it benefits from its range of trade areas served (all six possible world areas are served by direct services, whereas Felixstowe and Southampton only have five – both missing Oceania). Additionally, some of London Gateway’s services score double in the service count. For example, the CMA CGM/Hapag-Lloyd (NEWMO/EAX) and MSC (Australia Express) services to Oceania also call at Singapore, and so are counted as services providing connectivity to Asia as well. As previously mentioned, the connectivity of the Asian ports is much higher than that of ports in any other world region. As a general rule, large transhipment hubs tend to have high connectivity, as would be expected. The leading port in several regions has a very low connectivity score, for example, Scandinavia and the Baltic, North Africa and West Africa. This is mainly because these regions tend to have limited direct call services, instead being served mainly by feeder. Note that in North Africa, the highest scoring port is Casablanca because the major Moroccan hub port of Tanger Med falls under the West Med region in Drewry’s classification (and Valencia tops this region). In Oceania, Melbourne is a relatively small port by world standards, but Australia’s geographical isolation actually results in it being relatively highly connected (all six world regions). Now that this new analysis has been introduced with live data, our Ports & Terminals Insight report will track the ports gaining or losing the most connectivity each quarter, and seek to explain why and what the implications are. We will also explore ways of refining the analysis, and identify additional ways to sort and present the data. For shippers, port connectivity is as important as port size or scale. Having the widest possible range of direct services is a significant competitive advantage for all ports.